Yesterday was my biggest training day this year. It’s a template that will repeat for the rest of the week. I may be at home, but this is my training camp. Hours in the saddle with some swimming and running around the sides. After a winter of light training and a slow progression into spring it comes as a shock to the system. Training camps are a chance to live like a pro. Just train, leave your regular life behind. It seems simple, but like a pro you need to put the time into recovery. The objective isn’t to wear yourself down through continual fatigue; you will get tired, it will get harder, but you should always be capable of more. The aim is to complete a week that tests your limits not crosses them. A fine line which takes care to tread. I’m a veteran of big training weeks whether on Epic Camps or organised with friends. I know what’s involved in handling heavy training loads. I’m relying on that experience to make the most of my week. Incorrectly managed I could set back my training or aggravate injury. Big rewards come with risks. The goal is to complete the camp, but never be at the expense of my season. A successful camp begins in the week leading in. A camp should be treated with the same respect as a race. Effectively you taper, train hard and recover. At this stage the priority is losing fatigue. You want to arrive fresh and ready to train hard. Sacrifice a few days from your routine beforehand to ensure this. Plan. Have a set of goals. Write down what you want to achieve on the camp. At times you may want to quit; at times you will want to do more. Written aims help you keep perspective and make sound judgements. Know how the camp fits into your season and what you expect to get from it. Planning keeps you focussed on the key benefits and the long term goals. Once a camp starts there are two priorities: eating and resting. Repeated long training days expend huge amounts of energy, it is hard to consume sufficient calories. Driven by this deficit poor food choices are increasingly tempting. A few hard days and I know I’ll be drawn to sugar! Training is no excuse to eat poorly. Eat to train, eat to recover. When you’re not training, rest. Do as little as possible; sleep whenever you can. Ensuring you have no obligations before camp will make a big difference. Don’t underestimate the impact of mental stress. You are trying to escape the usual routine and create an environment that supports hard training. As a camp progresses you’ll notice increasingly vacant gazes amongst participants. Hard training leaves no energy for thinking. Train as much as you safely can. You are there to train; if there’s an opportunity to do more work, take it. It’s going to be hard, but you chose to be there. It’s what you wanted! Some of my most memorable Epic Camp moments come from pushing myself further and surviving. A week of relentless hard work that pays back over the rest of the year. When the camp stops, training stops. Most mistakes are made in the week following a camp. You’re still on a high, it’s easy to keep going. Delaying recovery will lead to breaking point. My first Epic Camp showed me how hard it is to manage the gains. 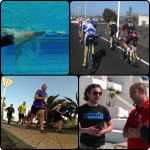 I returned home allowing myself a few days rest; then it was back into training, a final push for Ironman Switzerland. This did not work. Fatigue continued to grow and a ten day taper was insufficient. I was flat on race day. Train big, rest big. I now allow an entire week. I’m active, but sessions are comically light. I lose some of the fitness gained, but in the process freshen up; after seven days I begin to see the light. Don’t test your new fitness until you feel fully recovered. It may seem like you’re throwing away the hours of hard work, but without adequate rest you won’t see the benefits. Big training takes time to sink in. I’m a firm believer that a good routine and consistency is the most important part of any training program. Completing progressive workouts over a period of months is the foundation of Ironman fitness. A well scheduled week of hard training can fit into this program. Routine is good, but so are new challenges; pushing ourselves helps raise the bar. But the harder you train the more important recovery becomes.